RALEIGH – Several regiments of the U.S. Colored Troops (USCT) fought with conspicuous gallantry in the Union Army efforts to capture Fort Fisher in 1865. The efforts of these former slaves and free blacks will be recognized with the dedication of a North Carolina Highway Historical Marker (www.ncmarkers.com) on Thursday, June 2, at 10 a.m. at the National Cemetery in Wilmington , at the Market Street entrance. The Union Army and Navy staged a successful effort to capture Fort Fisher in Wilmington in January and February 1865, eliminating the South’s largest blockade running port and entry of supplies to the Confederate Army. USCT units engaged in the actions included the 1st, 4th, 5th, 6th, 10th, 27th, 30th, 37th, and 39th regiments. These soldiers and their white officers faced a determined enemy and possible execution if captured, as several captured Confederate officers claimed. The Confederates statements were not official Confederate policy, but they offered some insight, saying that if the blacks were free men, they would not be killed. If they were former slaves, they would be treated as house burners and robbers, and would be killed, as would Union officers. Several hundred USCT are thought to be buried in Wilmington , although the exact number is unknown. The Wilmington National Cemetery records burials of 92 members of the USCT, including those who died in combat and those who later succumbed to disease. The burials include 88 African American soldiers and four white officers. This is the largest USCT burial ground in North Carolina . The ceremony is also part of the Civil War Sesquicentennial (www.nccivilwar150.com). 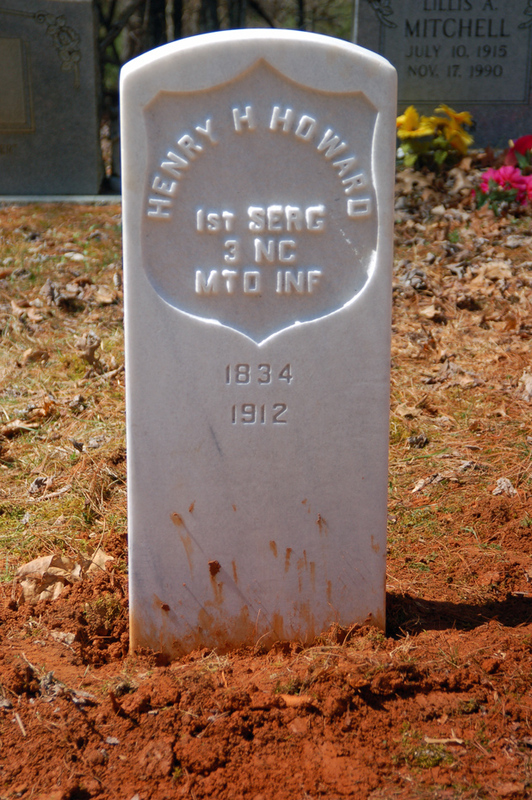 Until two months ago, the grave of Private Howard was marked only with a field stone. Glad that we could help getting him his VA stone so that others might know where he is buried. He is buried in Yancey County. Well folks, I’ll be in Gettysburg this weekend signing copies of North Carolina Remembers Gettysburg. If you get a chance, stop by and say hi! 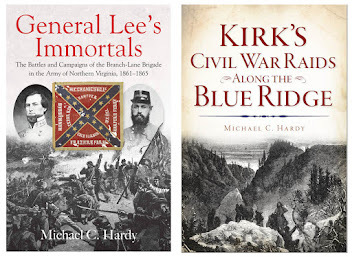 I’ll be signing books at the Reliance Mine at the Quality Inn on Friday May 27 at 10:00 pm, and at the American History Store at 7:00 pm on May 28. Plus, a whole lot of battlefield tramping! FOUR OAKS – There will be another Memorial Day at Bentonville State Historic site, on Saturday, June 11. Memorial Day rose from the practice of the families of Confederate and Union soldiers visiting the graves to honor the war dead. 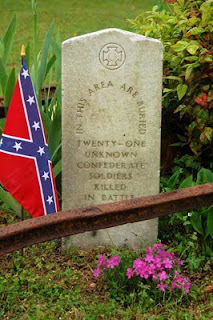 On June 11, grave markers will be dedicated honoring 20 Confederate soldiers who died from wounds received during the Battle of Bentonville in March 1865. The June Summer Seasonal Living History Program is part of the 2nd Saturdays series presented by the N.C. Department of Cultural Resources (www.ncculture.com). Artillery and musket demonstrations will take place throughout the day beginning at 10 a.m. The 2 p.m. dedication ceremony will include an examination of the care of dead Confederate soldiers after one of the war’s first battles by Cultural Resources Research Branch Supervisor Michael Hill. An accompanying story will be presented about the care of the dead at war’s end by Assistant State Archaeologist John Mintz, who led the team of historians and archaeologists that found the lost graves. The ceremony will also feature period music, and will be followed by a musket and artillery salute fired by Civil War re-enactors. The Harper House at Bentonville Battlefield was used by the Union army’s XIV Corps as a field hospital during the battle. When the Federals marched on to Goldsboro , they paroled at least 45 wounded Confederate prisoners of war they had treated, and left them in the care of the Harper family. Eventually 23 of the wounded died, and 20 were buried on the Harper family farm. The exact location of the graves had been lost, but rediscovery of a late 19th-century photograph seemed to show 20 head and footstones just south of the Harper family cemetery. High-tech ground penetrating radar used by Mintz and Wake Forest University archaeologist Kenneth Robinson confirmed the graves’ location. The Harper House Chapter of the United Daughters of the Confederacy, a site-supporting group, is raising funds to purchase headstones for the Confederate soldiers. Contact the site to contribute. Bentonville Battlefield State Historic Site is part of the N.C. Department of Cultural Resources, the state agency with the mission to enrich lives and communities, and the vision to harness the state’s cultural resources to build North Carolina ’s social, cultural and economic future. For more info rmation, visit http://www.ncculture.com/. Many newspapers picked up the news on a part of North Carolina’s sesquicentennial actives, including the Myrtle Beach Sun News, which you can read here. Some sources picked up the other event, the symposium held on May 20, including the Washington Post, which, interestingly enough, quotes NC NAACP leader Rev. William Barber, whom I do not recall seeing there, and who just got arrested for disrupting the General Assembly. Funny, I wonder why the reporter did not ask the opinions of the African-American scholars in attendance? A really good article in the New York Times on North Carolina and secession. You can check it out here. The Beaufort Observer gets into the action with a series of articles you can check out here. The 101 year old Confederate monument in Reidsville was taken out a day or so ago. You can read about it here and here. And on a different note, the Smith-McDowell House in Asheville is hosting author Rick Russell – you can learn more here. First off, what an amazing two days. To be included among some of the best Civil War scholars in the nation on Friday, to sit in the chamber of the state capital and hear the secession ordinance being read and passed, and to see the conserved flag of the 23rd North Carolina Troops, what an amazing weekend. My talk was entitled “’A People without Monuments is a people without Heroes’: Remembering the Civil War in Appalachian North Carolina.” There were a couple of good questions, and Ilook forward to further exploring one of those soon. The day of talks was followed by a reception that evening in the lobby of the Museum. It was great to see many people with whom I communicate online and to connect with some old friends. Saturday morning found us still in Raleigh. Except this time, we spent a large portion of time at the State Capital. At 11:00 am, there was a re-enactment of the passage of the secession act in the House Chamber (or was it the Senate Chamber?). This was followed by the dropping of a white handkerchief out on the balcony, signifying to the soldiers below to fire volleys. In May 1861, these volleys were fired by artillery, and, according to local accounts, the concussion shattered windows in businesses in town. So artillery fire was replaced by three well-timed volleys from the rifled-muskets of the 26th North Carolina Troops, Reactivated. For the next several hours, members of the 26th NCT delivered lectures on various subjects, including flags, uniforms, and North Carolina’s war record. In the afternoon, I visited the two new exhibits in the Museum of History – you would think having spent all day Friday there I would had a chance to wander around. But I did not. The first new exhibit is entitled The Story of North Carolina, part one, and begins with Native Americans who lived in North Carolina, then runs through the early 1800s. I really enjoyed the pirate display. Next we visited the redesigned “A Call to Arms” exhibit. They have added more materials on the War, focusing on the years 1861-1862. There are uniforms, weapons, camp furniture, and even a couple of flags. They do need to fix the label on the state flag of the 33rd NCT – it is a state flag, actually a second pattern state flag, not a Confederate first national. This was followed by another trip to the auditorium. 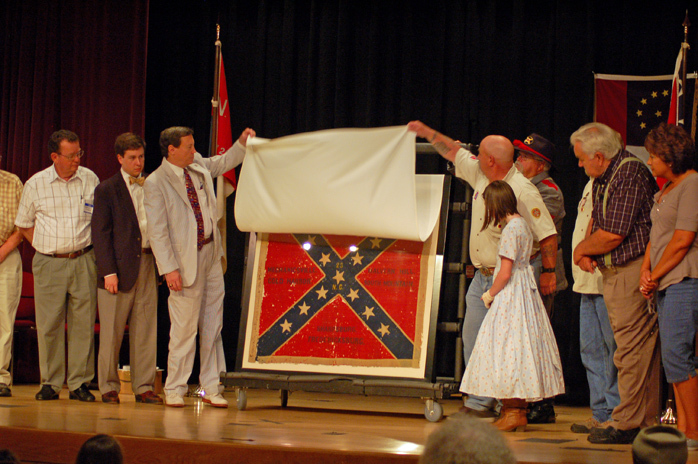 The North Carolina Division of the Sons of Confederate Veterans recently raised over $8,000 to conserve the Gettysburg-captured flag of the 23rd North Carolina Troops. Henry Mintz did a great job of giving a history of the regiment and its role at Gettysburg. This was followed by a gathering of descendants of the 23rd NCT on the stage, and then the unveiling of the flag. That is always a special treat. Then it was time to head home. A great weekend and it was a pleasure to meet so many of you. If you are interested in the War, and did not attend, you really missed out on a great weekend commemorating the War in North Carolina. On Saturday, I’ll be hanging with friends from the 26th North Carolina Troops, Reactivated, as they conduct a living history on the grounds of the capital. Then at 2:00 pm on Saturday, I’ll be attending the dedication of the conserved flag of the 23rd North Carolina Troops at the Museum. Looks like a great weekend, and I hope to see you there. DURHAM – After the Civil War, Confederate and Union veterans and their families visited the graves of those who had made the ultimate sacrifice. Gen. John A. Logan had been at the surrender negotiations at Bennett Place in April 1865, and upon becoming a congressman he was instrumental in the establishment of Memorial Day to honor the U.S. military. On Saturday, May 28, 10 a.m-4p.m., Bennett Place State Historic Site will continue the tradition. Soldiers from many time periods will be available at the living history event. Re-enactors representing the American Revolution, Union and Confederate Civil War, Rough Riders from the Spanish American War, World Wars I and II, and other periods will participate. The evolution of weaponry and uniforms also will be apparent, from a flintlock musket to an M-1 Garand, or the hunter frock preferred by George Washington for his soldiers to the field uniform of World War II. The program is free, but donations are greatly appreciated. The Historic Bennett Farm grounds, nature trails and picnic area will be available, and the Visitor Center will be open. Many exclusive Civil War artifacts in the museum gallery interpret the lives of the Bennett family, and Union and Confederate soldiers also. Visitors can purchase Bennett Place and Civil War-related collectibles that will benefit preservation of this historic landmark. Once the home of James and Nancy Bennett, the farm became the site of the largest troop surrender of the American Civil War in April 1865, involving nearly 90,000 soldiers from North and South Carolina , Georgia , and Florida . The mission of Bennett Place State Historic Site is to preserve and interpret the surrender and the lives of 19th-century yeomen farmers such as the Bennetts. Bennett Place is located at 4409 Bennett Memorial Road , Durham , NC , 27705 . It is within the Division of State Historic Sites in the N.C. Department of Cultural Resources, the state agency with the mission to enrich lives and communities, and the vision to harness the state’s cultural resources to build North Carolina ’s social, cultural and economic future. For more info rmation on Cultural Resources, visit http://www.ncculture.com/. We have arrived at secession week here in North Carolina. On May 20, North Carolina left the Union. But alas, I get ahead of myself and my story. South Carolina seceded on December 20, 1860, and was quickly followed by Florida, Alabama, Mississippi, and Georgia. North Carolina could not really decide what do, but managed to put together a call for a convention to consider the question and to elect delegates. The call for a convention was barely defeated. It is interesting how past historians put a spin on this – often writing how the majority of people in North Carolina were pro-Union. Well, that majority was extremely slim. Just 650 votes, less than one percent of the votes cast, kept North Carolina from holding a convention to consider secession. So North Carolina settled into a wait-and-see stance for about six week or seven weeks. That changed in April. Abraham Lincoln sent reinforcements to Fort Sumter, and before they could arrived, Confederate forces opened fire on the South Carolina fortification, compelling the garrison to surrender on April 13. Lincoln then issued his famous call for 75,000 militia to go into the Deep South states to deal with the rebellion. North Carolina Governor John W. Ellis denied Lincoln the use of North Carolina Troops, and ordered the Federal fortifications at Wilmington and Morehead City seized, along with the arsenal at Fayetteville. Ellis then called the general assembly into special session on April 17. On May 1, the General Assembly issued a call for a convention and the election of delegates. Some members also attempted to pass legislation that would require any act of the Convention to be ratified by the people, but this failed. The General Assembly Act called for men to go to the polls on May 13 to elect 120 delegates, to meet in Raleigh on May 20. Those that met in Raleigh on May 20 fell into two categories: secessionists, who believed in the idea that a state could secede from the Union; and revolutionaries, those who denied the right of secession and believed that a state could only leave the Union by resorting to revolution. 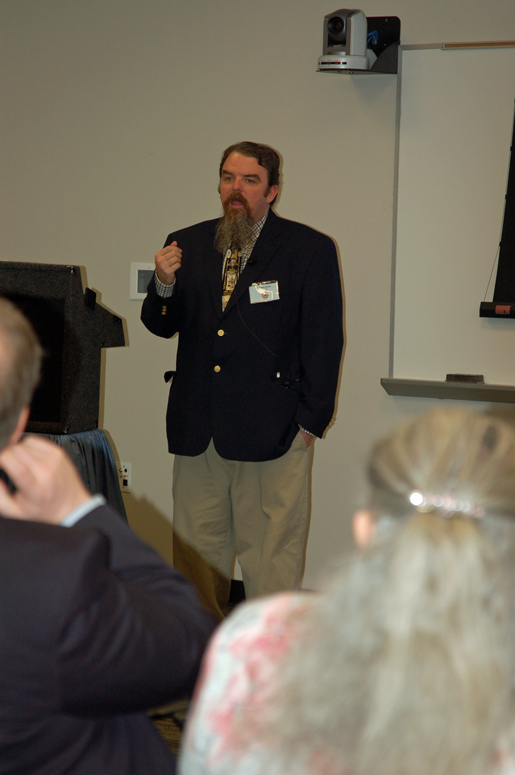 Burton Craige, convention delegate from Rowan County, introduced the secession ordinance, which was unanimously adopted. The convention then adopted the Constitution of the Confederate States. On May 21, the delegates gathered and signed North Carolina’s ordinance of secession. So, my question to you is this: was North Carolina the last state to secede from the Union? Here is the dilemma. Virginia left the Union on April 17. North Carolina on May 20. However, both Virginia’s and Tennessee’s secession ordinances had to be ratified by the people (white male voters). Virginia’s secession ordinance was ratified on May 23, and Tennessee’s on June 8. I could go on and on with these sources. Tennessee and Arkansas claim the same thing. What do you think? Was North Carolina the last state to secede, or do the public ratifications of the secession ordinances from Virginia and Tennessee bump us up the list? On May 20, 1861, North Carolina seceded from the Union to join the Confederate States of America. Thus began the state's involvement in the American Civil War. This weekend the N.C. Museum of History and the State Capitol in Raleigh will commemorate the 150th anniversary of North Carolina's secession vote. On Friday, May 20, the Museum of History will open the small exhibit North Carolina and the Civil War: The Breaking Storm, 1861-1862, which is located within the museum's military history gallery A Call to Arms. On Saturday, May 21, the State Capitol will present North Carolina Secedes, a living history program that includes a re-enactment, period music, a drill and dress parade, lectures and more. Details about the exhibit and the program follow. Both are free and open to the public. North Carolina and the Civil War: The Breaking Storm, 1861-1862 highlights the events leading up to the outbreak of the Civil War and the early battles. On view from May 20, 2011, through Oct. 29, 2012, the exhibit features artifacts related to the state's role in the War of 1812, the Mexican-American War, the nation's western expansion, and the Civil War. Civil War artifacts include the Confederate first national flag of the 33rd Regiment N.C. Volunteers, 1861-1862; and an M1833 dragoon saber and scabbard (1861-1862) used by Zebulon B. Vance, colonel of the 26th Regiment N.C. Troops and later the state's wartime governor. A bugle, snare drum, banjo and flugelhorn are among the musical instruments on exhibit. North Carolina and the Civil War: The Breaking Storm, 1861-1862 is the first exhibit in a three-part series that explores the four-year conflict that changed the state and nation. The exhibit series, titled North Carolina and the Civil War: 1861-1865, tells the story of North Carolinians who lived, served and sacrificed during the nation's bloodiest conflict. The series' second exhibit, debuting in 2013, will focus on the year 1863. The final installation, opening in 2014, highlights the last engagements of 1864-1865 and postwar consequences. North Carolina Secedes, a living history program at the State Capitol, takes place Saturday, May 21, from 10 a.m. to 4 p.m. The event will commemorate the state's historic vote and look at North Carolina's early wartime preparations. At 11 a.m. in the historic House Chamber, hear readings from Secession Convention speeches. 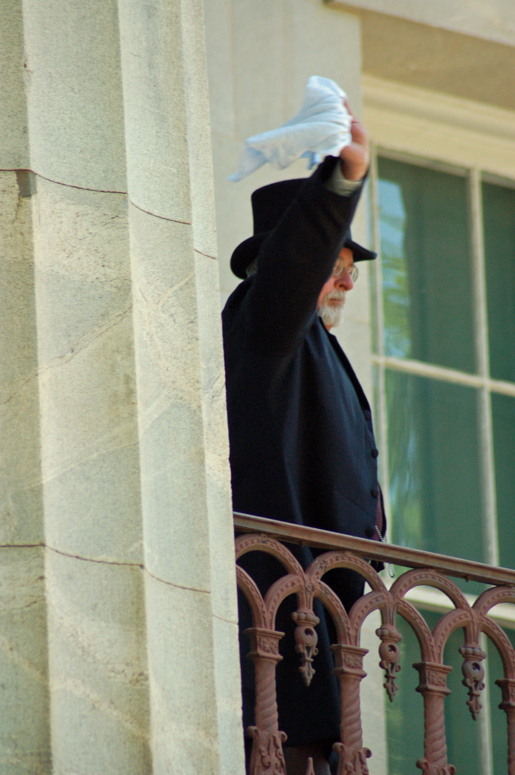 Contemporary accounts of May 20, 1861, recount that after the unanimous vote, someone dropped a handkerchief from the Capitol's west portico to signal to the crowd below that North Carolina had seceded and joined the Confederacy. Maj. Stephen Dodson Ramseur's artillery unit, which was posted on the grounds for the occasion, announced the historic moment by firing its cannons. 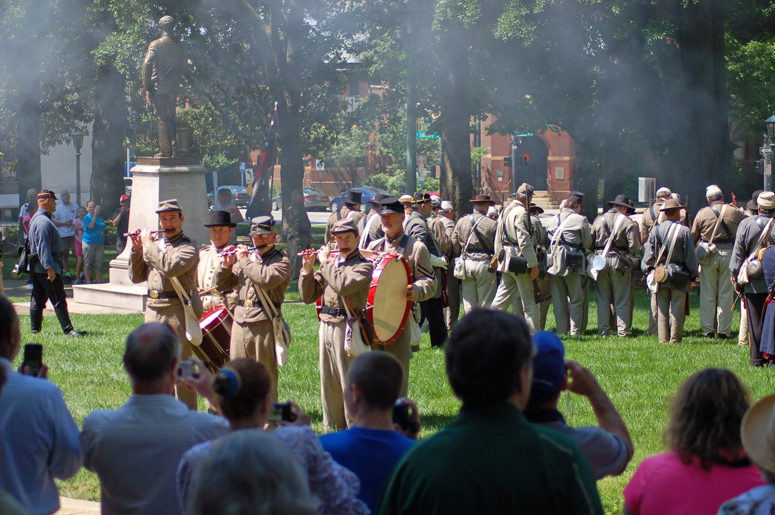 During the May 21 program, approximately 100 re-enactors from the 26th Regiment N.C. Troops will portray Maj. Ramseur's battery and re-enact an infantry drill and rifle-fire during the war. In the afternoon watch the drill and dress parade, and hear a field music concert. Lectures will focus on the state's military organization, war flags, and the early uniforms and equipment of both North Carolina and Union soldiers. Additionally, a facsimile of North Carolina's Ordinance of Secession will be on display inside the Capitol. The exhibit and the living history program are presented as part of the N.C. Civil War Sesquicentennial, a statewide initiative organized by the N.C. Department of Cultural Resources in commemoration of the 150th anniversary of the Civil War in North Carolina. 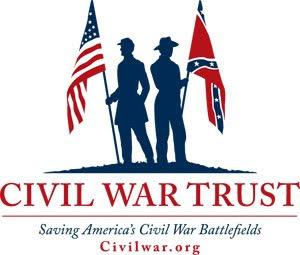 For more information go to www.nccivilwar150.com. To learn more about the Museum of History, call 919-807-7900 or access www.ncmuseumofhistory.org or Facebook. For details about the State Capitol program, call 919-733-4994 or visit www.nchistoricsites.org/capitol/default.htm. The N.C. Museum of History is located at 5 E. Edenton St. Hours are Monday through Saturday, 9 a.m. to 5 p.m., and Sunday, noon to 5 p.m. The Museum of History, within the Division of State History Museums, is part of the N.C. Department of Cultural Resources, the state agency with the mission to enrich lives and communities, and the vision to harness the state's cultural resources to build North Carolina's social, cultural and economic future. Information is available 24/7 at www.ncculture.com. If you have hung out on the blog for any time, you have probably figured out that I have a strange passion for cemeteries. I’m one of those folks who believe they every soldier, whether Confederate or Union, deserves to have his grave marked in some fashion. This past Saturday, I had the honor of the traveling to Ashe County to participate in the dedication of a stone to Pvt. Hamilton Bare of the 37th North Carolina Troops. 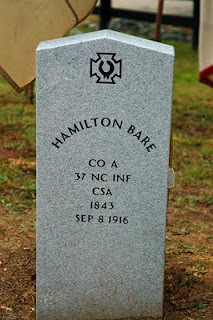 Bare’s grave was marked only with a field rock until a 90+ year old descendant informed fellow historian Tar Heel Clint Johnson just who was buried there. Johnson took the lead, and procured a VA stone for Bare. Hamilton Bare was conscripted into service on August 15, 1862. He was just 18 years old. 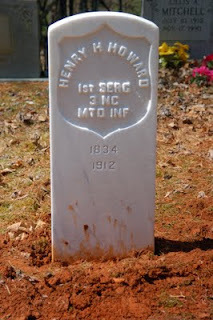 He served throughout the war, save for a period between May and September 1863 when he was absent without leave. Bare was captured on April 2, 1865, and spent three months as a prisoner of war at Point Lookout, Maryland. Saturday’s service included a biography on Hamilton Bare, made by one of his many present descendants. I gave a talk on the history of the 37th NCT, and then reenactors from the 26th North Carolina Troops and the 37th North Carolina Troops fired three volleys over the grave. Just one more of North Carolina’s 125,000 Confederate graves is now marked. Many thanks to Clint Johnson for making this happen, and for his invitation to speak. 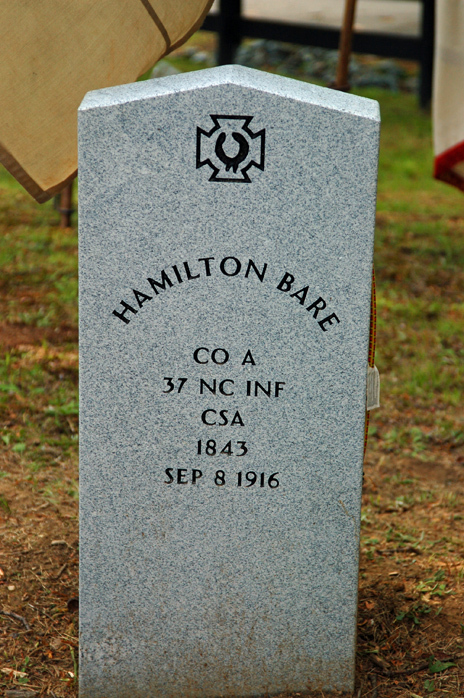 Hamilton Bare had a brother in the 37th North Carolina Troops, Farrow Bare. His final resting place is still unknown, and might be at the same cemetery that Hamilton is interred in. If you have any information, please drop me a line. “The last two weeks are big events of the greatest importance…” - 4th NCST. 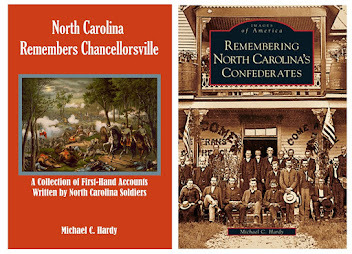 Folks, it is with great pleasure that I announce the release of North Carolina Remembers Gettysburg. 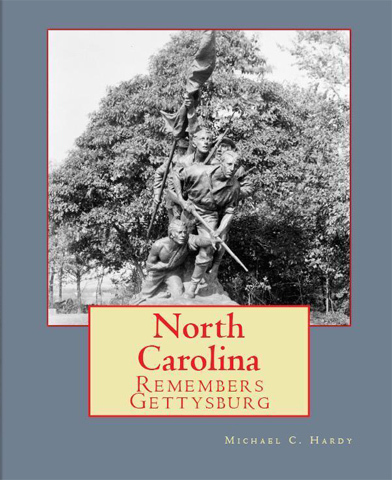 This book is a collection of 77 first-person accounts of the battle of Gettysburg written by North Carolina soldiers. This new volume is loaded with details of the battle: what the men experienced, written just days or weeks after the battle; the great debate of 1877 on who went the furthest, Pickett or Pettigrew; and, how their views on the battle changed toward the close of the nineteenth century. These letters first appeared in newspapers just days after the battle, and continued into the twentieth century. The letters were written by the men who participated in the battle, men who had witnessed the death of Col. Henry K. Burgwyn, Jr., of the 26th North Caroline Troops on July 1; the twilight struggle of the 6th North Carolina State Troops on July 2; and, the charge of Lane’s Bigade on July 3. Many of these letters have not been read since their original publication decades ago. But you can read what they wrote, what they experienced, and in their own words. It is what the soldiers wanted you to read, the stories that they wanted you to remember. Orders for signed copies are now being accepted. The cost is $20, shipping and handling included. Please include to whom you would like the book inscribed. Please visit my web site, http://www.michaelchardy.com/books.html to order today. Today is Confederate Memorial Day, or Decoration Day, in North Carolina. Let me encourage you to get out to a local cemetery and think about what the common Tar Heel Confederate soldiers did, 1861-1865. Explore Wilmington’s role in two great American conflicts with historian Dr. Chris E. Fonvielle, Jr., author and associate professor of history at UNC Wilmington. Discover how and why Wilmington was occupied by British forces in 1781 and the role the town played in the Southern Campaign. Cape Fear Museum, 814 Market Street. A walking tour focused on the Revolutionary War & Civil War history of the Brunswick Town-Fort Anderson State Historic Site. 8884 St. Philip's Rd. SE, Winnabow, NC. Attendees will meet at the site at 10:30am. Discover what life was like in Wilmington under Union control in the closing months of the Civil War in 1865. Has five days come and gone? Still trying to get the manuscript off – all this "editing and writing captions for pictures and editing and picture placement and editing and indexing and editing" is taking a considerable amount of time. This Saturday, I’ll be helping with the Confederate Memorial Day activities in the Toe River Valley. We’ll be reading the names of men who died in Yancey County and firing a salute on the grounds of the courthouse in Burnsville at 9:00 am on Saturday. Saturday, about dusk, I will be participating in the candlelight memorial service at the old Bakersville Cemetery in Mitchell County. Everyone is encouraged to join us and bring a friend. Whew… what a writing marathon. I finished the draft for Civil War North Carolina this past Saturday. 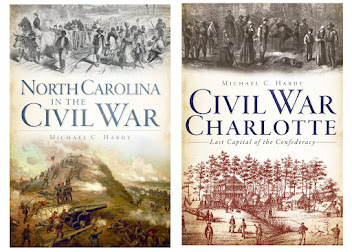 For those of you who don’t know, Civil War North Carolina is a concise, well-illustrated history of North Carolina and the war. 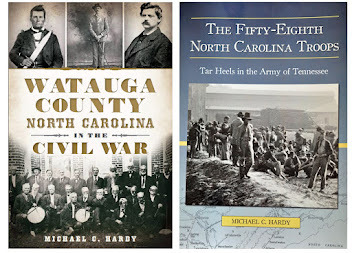 The first five chapters cover events in North Carolina from 1860 to 1865. 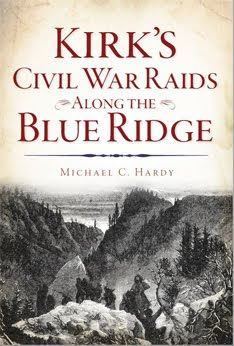 Chapter 6 looks at Tar Heel soldiers who marched away. 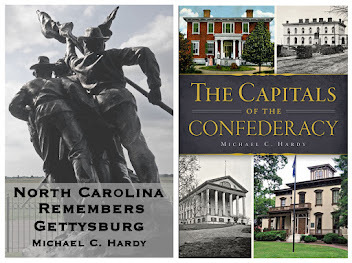 Chapter 7 examines reconstruction, Chapter 8 the memorialization process (monuments, cemeteries, veterans groups like the UCV, UDC, and GAR), and chapter 9 is a “looking for the war today” examination of museums and historic sites. While this book does not present anything new, per se, it is the first time that you will be able to read about the war, reconstruction, and the reunion process all in one place. Well to be honest, there is really no other place to read about the memorialization process. If there is, I’ve not found it. So what where my primary resources? Period newspapers, bios on Vance, Worth, Woods, and Stanly. I used histories by Powell, Barrett, Trotter, Meekins, Bradley, and Inscoe. And I used three dissertations – Wood’s Port Town at War: Wilmington; McGee’s On the Edge of the Crater (Raleigh); and Auman’s Neighbor against Neighbor. Of course, there were a hundred more other books and articles that I consulted. 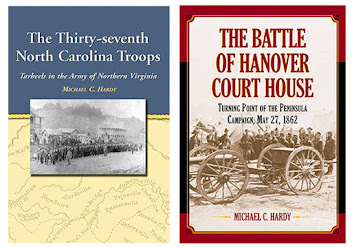 Civil War North Carolina is being published by the History Press out of Charleston, South Carolina. I look forward to telling you more about it in the fall when it is released.